The trailer for ALBERT NOBBS starring Glenn Close in the title role has been released. It looks amazing. Albert Nobbs is based on the short story by Irish author George Moore. 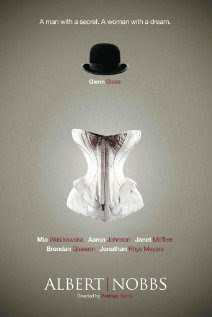 Glenn Close's character, an Englishwoman in 19th century Ireland, longs to be a hotel butler and dreams of opening her own store. Glenn Close first appeared as Albert Nobbs in 1982, in Simone Benmussa's adaptation of the Moore short story for the stage. Poster Copyright @ Roadside Attractions.